Aaaand it begins! NYFW has launched with new venues, new attitudes and new fashion designer inspirations. I just thought I would give you a sneak peek at what inspired some of the brands we will cover on this site. It is also just an excuse to throw up a bunch of fashion illustrations and sketches just because I like to look at them. Nicholas K. looks to Nineties hip hop for his Fall 2017 collection. 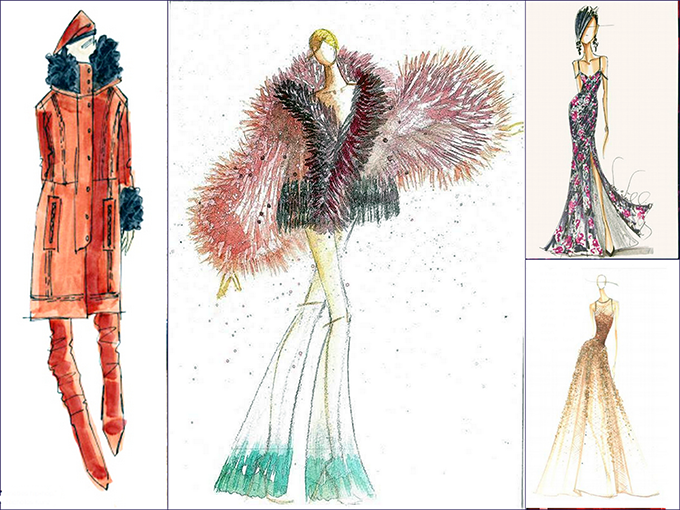 Based on his fashion sketch, that translates to military silhouettes with the swagger of fur collars. Son Jung Wan drew a flamboyant design. She was inspired by the big, exaggerated silhouettes of the 1980s. Her color palette includes red, pink and sea green. Look for her collection to combine layers of handcrafted knits and rich velvets. I know I can always look for glamor and romance from the THEIA collection. Designer Don O'Neill is interpreting Dutch florals and Baroque pearls as a motif but giving it a shiny 1970s edge. Designer Pamella Roland often works her love of contemporary art into her elegant collections. For Fall 2017, a Rothko exhibit at the Pace Gallery served as her muse. So there you have it. A sneak peeks at a few of the shows Ms. Fabulous will cover during the NYFW Fall 2017 season. I love the little fashion sketches that the designers provide, but they still pale next to the real looks when you see them on the model. Good luck to all of my designer, editor, PR and photographer peeps who will not get any sleep this week!